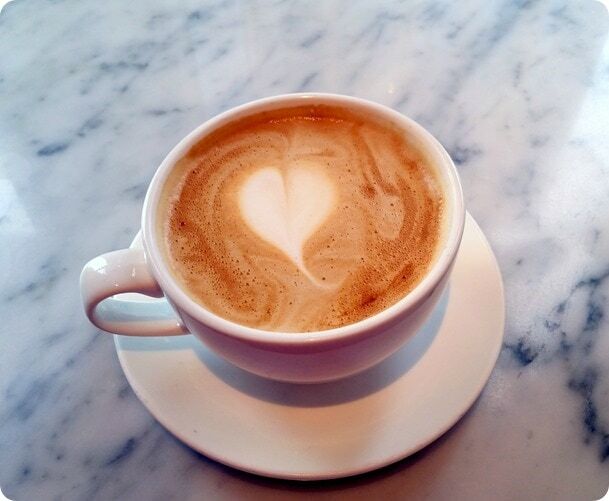 Still having egg whites, low fat peanut butter and sugary nonfat lattes or fat free yogurt? Read on to learn why you should consider ditching the low fat and low cholesterol diet trend once and for all. This post was originally a guest post I wrote for fellow dietitian Kath’s blog. It was a big hit over on her site, so now that a couple years have passed, I thought it was worth re-sharing over here for those of you that missed it! Enjoy! A lot of my readers, friends, and AnneTheRD nutrition clients have asked how my own diet (and by diet, I simply mean what I eat, not being on a diet) has changed since learning more about nutrition. Honestly, I tell them? I eat more fat. More fat, you say? But isn’t that supposed to be bad for us? Well… not necessarily. During the 1980s, there were a couple major reports that came out that would alter the way Americans ate and kick off the low-fat and anti-cholesterol craze that I’m sure many of us remember well (and might still be abiding by). In these reports, decreasing saturated fat and dietary cholesterol were labeled as the single most important changes that one could make to improve their health, which translated into a national food production frenzy to create low fat diet products. Everyone started eating eggs without the yolks, low fat crackers, low fat cookies, low fat dairy products, low fat everything. But something strange happened – Americans continued to get heavier than ever, and their overall health wasn’t improving, either. The underlying problem it seems, at least related to processed food, was three fold. First, the calorie content of the products (and the overall diets) remained the same, but their satiety went down, due to the absence of fat, which keeps you full and satisfied longer. This can lead to potentially overeating because you never feel satisfied. 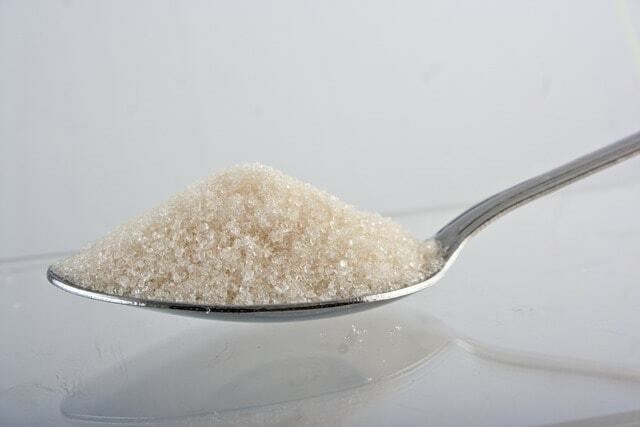 Second, extra sugar (and salt, in some cases) was added to make the products still taste okay, which meant that the products, while lower in fat, were now higher in carbs. And ironically, something I learned in biochemistry class in grad school is that excess carbohydrates, especially those that are processed/refined, actually increase your cholesterol (and your triglycerides, a type of fat in the blood that are an important measure of heart health) more than dietary cholesterol intake does! Research has shown that when people with high LDL cholesterol (the “bad” kind) purge their diet of saturated fats, they lower one kind of LDL, but not the small, dense particles that are linked to high carbohydrate intake and are implicated in heart disease. Further, studies are showing that high total cholesterol might not be a problem at all anyway, especially if the two types of cholesterol (LDL and HDL) are in balance and there are not an abundance of small, dense LDL. After all, cholesterol is vital for a number of body processes, including production of hormones and healthy cell formation. Some studies even show that higher cholesterol can correlate with a lower risk of heart disease, and a recent study from from UCLA found that the majority of heart attack patients (75%) admitted to their hospital did not have high total cholesterol – but they did have metabolic syndrome, which is the name for a group of risk factors that increases your likelihood of heart disease. One of these risk factors is high triglycerides; the others include hypertension, high fasting blood sugar, abdominal obesity, and low HDL (“good” cholesterol). Unlike high triglycerides, though, there is a lack of concrete evidence showing that saturated fat intake (from real, unaltered sources) leads to heart disease or increased mortality. And what causes high triglycerides? You guessed it – diets high in sugar and refined carbohydrates, which is what manufacturers were replacing the fat in their products with. Heart disease, which is also called cardiovascular disease, or CVD, is, as we know, a BIG problem in the U.S. right now. Recent studies have looked at the relationship between heart disease and lifestyle, suggesting that 90% of CVD is caused by modifiable diet and lifestyle factors. But what (in addition to, potentially, high sugar intake) are those diet factors, if cholesterol and saturated fat were not necessarily to blame? Another problem that stemmed from the increased consumption of vegetable oils is that the ratio of omega-6 to omega-3 polyunsaturated fats in the American diet changed. Vegetable oils (like soybean, sunflower, corn, cottonseed, sesame oil, etc. ), are high in omega-6 fatty acids, which, while they do have their function, are now being over-consumed, particularly in comparison to omega-3. Between 1935 and 1939, the ratio of omega-6 to omega-3 fatty acids was reported to be 8.4:1; today, estimates of the ratio range from an average of 10:1 to 20:1, with a ratio as high as 25:1 in some. According to a report from the USDA, Americans now get almost 20% of their calories from soybean oil, with nearly 9% of all calories coming from omega-6 alone. So, what’s the problem with that? Well, omega-6 is pro-inflammatory, and inflammation in the body can be a factor in increased heart disease risk; in fact, elevated omega-6 intakes have been associated with an increase in all inflammatory diseases. On the flipside, studies are showing that a lower ratio of omega-6 to omega-3 (so, more omega-3 intake – and/or less omega-6) can reduce the risk of chronic diseases. Higher levels of long chain omega-3s in the blood have been shown to potentially protect against degenerative diseases, and research also shows strong evidence that the omega-3s EPA and DHA can help lower triglycerides and blood pressure. So, where does this leave us in terms of everyday eating? My #1 tip is to eat real food. Simply avoiding processed food will go a very long way in decreasing your omega-6 intake (due to the abundance of omega-6 rich vegetable oils in them), and will also greatly decrease your refined carbohydrate/sugar intake, too. 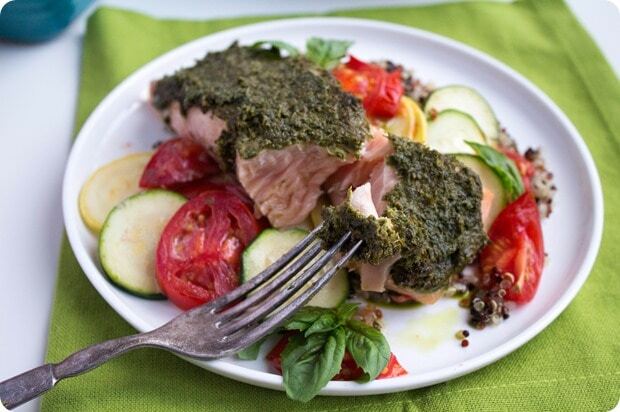 Eat fish, especially fish like salmon (favorites: Pesto Baked Salmon, Salmon & Vegetable Egg Casserole), tuna (try my Black Pepper Crusted Yellowfin Tuna), or sardines (here’s a simple way to make them tasty), which are higher in omega 3s. Think about purchasing grass-fed, instead of grain-fed, meat. 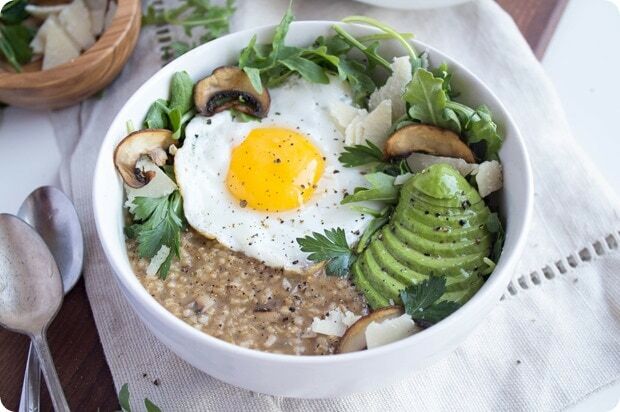 Throw chia seeds, walnuts, ground flaxseed (or even avocado in the case of my savory oatmeal recipe pictured below!) into your favorite oatmeal, smoothie, or yogurt bowl to add omega-3s. Eat not just egg whites but the yolks, too, and enjoy the extra flavor and nutrients they provide. Enjoy nuts and seeds, and avocado, and even butter, plus anything else you might have avoided because you thought it had too much fat. If you are a dairy fan, go for the full fat version, and savor it! I still hear so many people order nonfat sweetened lattes at cafes – go for the whole milk and you won’t need so much sugar to make it taste good! And if you are going to buy packaged foods, check the ingredient list. The shorter, the better, and make sure you recognize everything on there as real food, too. Thank you so very much for such a thoughtful and well-articulated post! I will keep this saved for reference whenever needing to address fat intake with others. The association between sugar and trigylcerides was not one I knew much about a few years ago. It’s amazing how much many of these diseases play into one another. Thank you again! Thank you thank you! There is so much misinformation on this topic! Everyone should read this! When I was recovering from my eating disorder, I switched to whole fat dairy foods like milk and yogurt and I don’t know if I could ever go back at this point. It’s SO much tastier and doesn’t leave me hungry again 10 minutes later. I think this is such an important message for everyone and I’m so glad you’re spreading the word!! Amen to all of this! When I was in grad school, I started doing research on the “low-fat” craze and the perception people have on fat containing foods (it’s negative… surprise surprise) since the whole mindset of “it’s okay to eat fat” is newer, especially for those who grew up during the popular time periods when low-fat and fat free diets were incredibly trendy. Hoping to publish over the next couple years so it always makes me feel great the more individuals I see writing about this “fat is ok” concept. Not enough people do!! Fat needs to be perceived in a much more positive light. Love! Just as I was starting to question how do I eat responsibly having this information, you hit me with the practical advise! Awesome! I’m so glad you wrote about this topic! We just reviewed this last week in nutrition school. What’s unfortunate though is that modern science has not admitted this and is still advising patients to eat low fat. My Mom had bypass two years ago and her doctor still insists she should be eating low fat, but to my mother this translates into eating low fat processed foods which I keep telling her is doing more harm than good. It’s one thing to watch how much saturated fat you’re ingesting vs. replacing it with these foods. I’m curious about your thoughts on “hyper-responders” to dietary cholesterol. I have a family history of heart disease so I was told not to eat egg yolks or other high cholesterol foods, but some of these studies seem to indicate the opposite. Diet is so specific to each person, but if you have any general thoughts I’d love to hear them! Thanks! I am not well versed on the hyper-responder topic, so I can’t really comment here beyond what I already shared in this post as it relates to most people – I’m sorry! This is such a great post! I truly love reading all your posts and especially the ones like this one. I’m an “Anne Fan”! 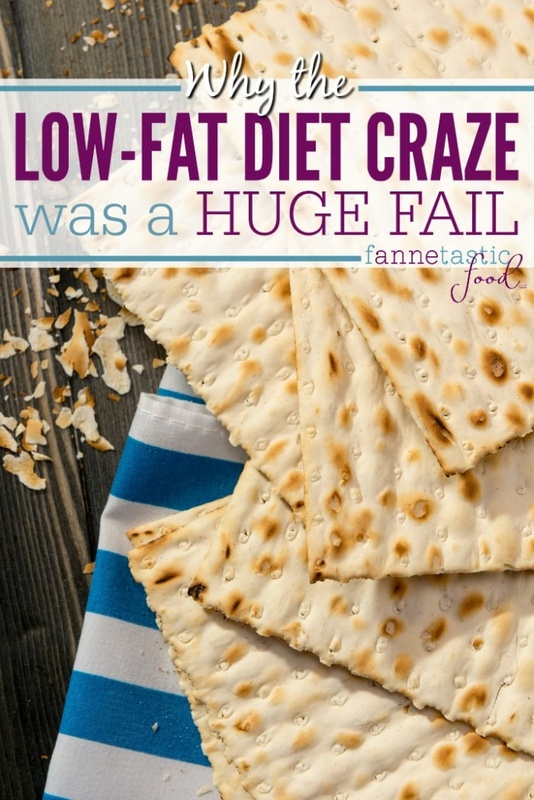 Anne, you make some great and valid points, but I must admit I get a little salty when people discuss the “low fat diet craze” without explicitly mentioning that at no point did Americans actually drop their fat consumption as a result of this craze. I remember all the low fat junk food growing up very well (and fondly, to be honest- those Snackwells cookies are good!) but to state that “the increase in carbohydrate and sugar consumption [is] DUE (emphasis mine) to the low fat diet craze” is misleading. I see nutritionists everywhere propagating it, but it’s just not true — Americans didn’t REPLACE junky high-fat foods with junky low-fat foods. The national trend data shows that our intake of fat stayed pretty constant; even our intake of saturated fat stayed about the same. What we did is ADD low-fat junk foods to everything we were already eating. That’s not an indictment of low fat diets; it’s an indictment of low fat junk foods. The distinction is enormously important. Without it, this fallacy of low-fat diets somehow being responsible for increased weight gain and disease continues to live on. Populations around the world with genuinely “low fat” diets comprised of wholesome foods are among the world’s healthiest, longest-lived peoples. Thank you for sharing your thoughts, Emi! Always open to hearing other perspectives and I’ll check out the posts you linked to. I think the bottom line either way is the more real food and less processed food people are eating, the better. Thanks! Yes to all of this! I think some of the points you made are valid, Anne, but I can’t stand it when I see dietitians perpetuating this myth that Americans actually ate less fat during the “low fat craze”- the data on what Americans ate shows that we didn’t ever actually eat less fat! I’m personally a fan of diets full of healthy plant fats for some of the reasons you mentioned, but I recognize that there is evidence to support lower-fat whole-foods diets being good for health. OMG…lol, I remember Snackwells. They were not good, they were HORRIBLE! You’d be better off to eat the box they came in. Really good, sensible, informative post, Anne, thanks very much! And grounded in solid science, too. Thank you! Love it! I have had a couple clients this week that my recommendation to them was to eat more! They’re like “what do you mean eat more to lose weight?” It’s important to eat more of the right kinds of food! I love this post. Thanks for highlighting the importance of fat & whole-fat dairy. We eat actin of fish in our house, so those recipes look great as well! As a type II diabetic I have always been told to limit sugar, eat low fat, eat whole grains, loose weight, exercise, and take my insulin. I have followed instructions like a good patient and all the while I have gotten sicker. Several months ago the rebel in me decided I’ve had enough and there has to be a better way to treat this disease. I did a lot of research and started on a ketogenic diet where around 65% of my calories comes from healthy fats. Since then I have been able to cut my insulin by more than half, I’ve lost weight, and my lipids are a lot better. I have never felt better. At first my doctor was livid I wasn’t following his advice, however, he is very impressed with my results and he is turning around. 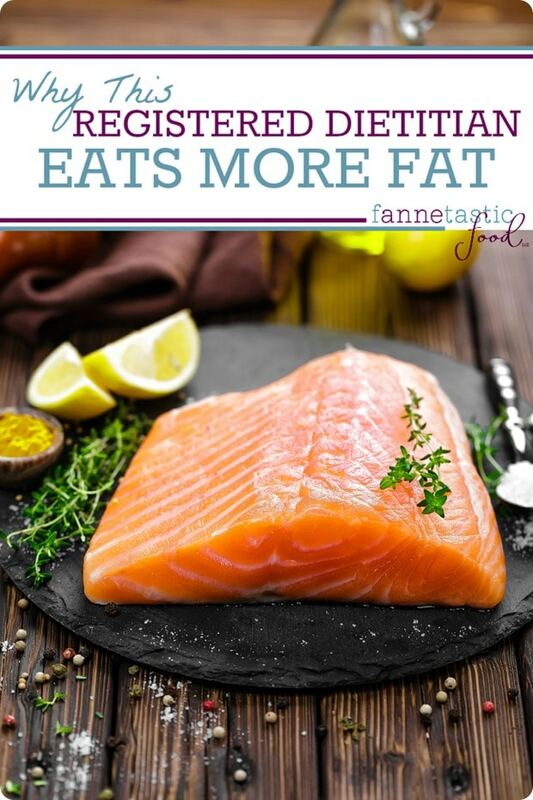 Our bodies were made to eat fat. We thrive and perform better when we use ketones for fuel instead of glucose. Thanks Anne for being brave enough to talk about healthy fats and their benefits in good health. You rock! I’m so glad to hear you found what works for you, Rainey! Do remember though that for T2 diabetics (and T1’s as well) limiting protein intake is very important. Also, nuts have an effect on BG levels – I don’t avoid nuts because of the fat. I don’t eat peanuts at all now though because of the terrible effect they have (not being a true nut). I was eating loads of peanut butter and my HBA1C went up from 5.2 to 6.8! I am going to start fasting as well – fasting in the sense that with a high fat diet, you just don’t need to eat so much. Great article. Real food is the way to go, and I never understood how anyone thought low-fat cookies were worth it. They taste like cardboard.